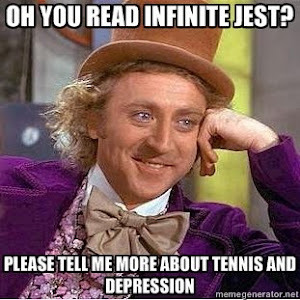 I'm afraid I haven't read Infinite Jest. Would it be useful to do so, if I'm to read what you have to say about it, or is that a bit too book clubbish? Not that I've ever belonged to a book club. Talking of books I am so enjoying 'The Good Soldier' by Ford Maddox Ford which I had thought would be hard work. Isn't Twitter just for the birds? I also hate book clubs, and I loved Infinite Jest, which was also the first work by DFW I read. Now I can't enough of the guy. I hope you feel that way, too, but I'll read your blog even if you don't. I've read several of BEE's efforts (and I absolutely love American Psycho) but was only vaguely aware of DFW. Pat, The Good Soldier is my favourite book in the world. I was amazed to find out years after I first read it that it's considered to be a bit of a challenge - it had me gripped from beginning to end! You could read along, Z, if you like. I'd like to think the blog will have value to people who don't. But I really don't know. It could turn out to be an utter omnishambles. Thank you Donna. I hope I do him justice. Looking good so far.